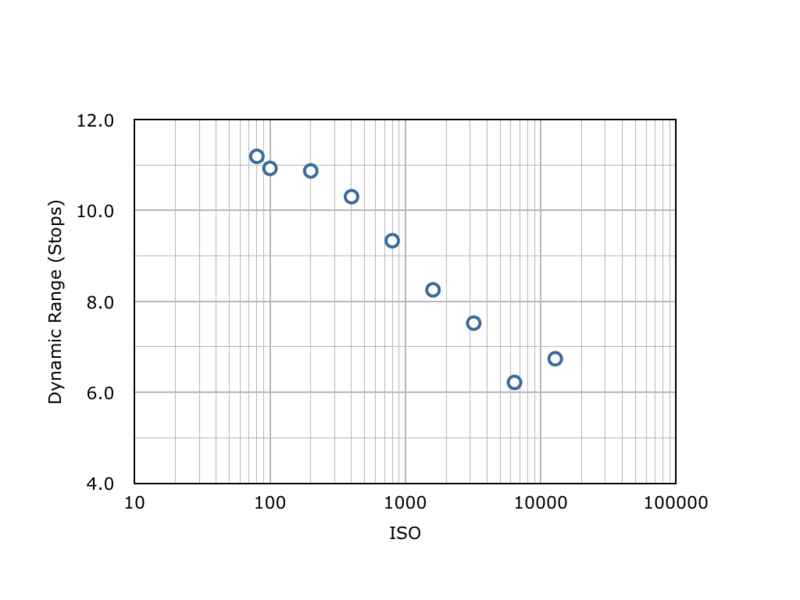 I’ve measured the gain and read noise of my Canon Powershot G15 at different ISO settings. For the dark exposures, I shut myself in a cupboard, switched off the lights, and took exposures of 1/4000 second at 28 mm equivalent focal length and f/8. At each ISO setting I took four dark and four bright images. I then converted the raw files to FITS using Jatte and measured the gain and read noise using IRAF’s findgain task. This measures the noise in the differences of a pair of dark and a pair of light images, and derives the gain and read noise from the standard noise model. I ended up with eight measurements for each ISO setting, since I had two sets of pairs and one measurement for each channel which allowed me to check for consistency. The results are shown in the following figure and table. The decline in gain with ISO setting is approximately as expected, until an apparent turn up at ISO 12800. This odd behaviour at ISO 12800 is also seen in a plot of the mean rate (in DN/s) against ISO. If the gain declines as the inverse of the ISO, the mean rate in DN/s should increase linearly with ISO. This is seen from ISO 80 to ISO 6400 (the slope is 0.98 not 1, but that’s not an important difference). 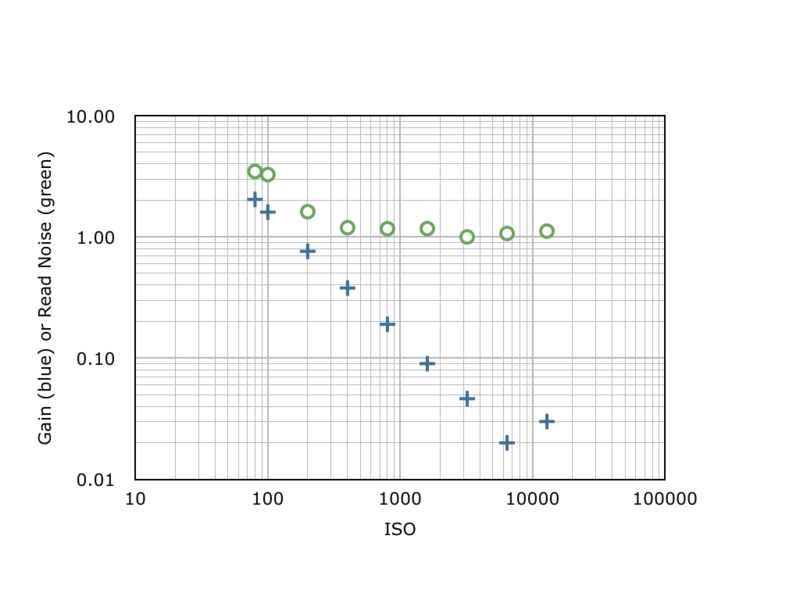 However, the increase is sub-linear between ISO 6400 and ISO 12800. 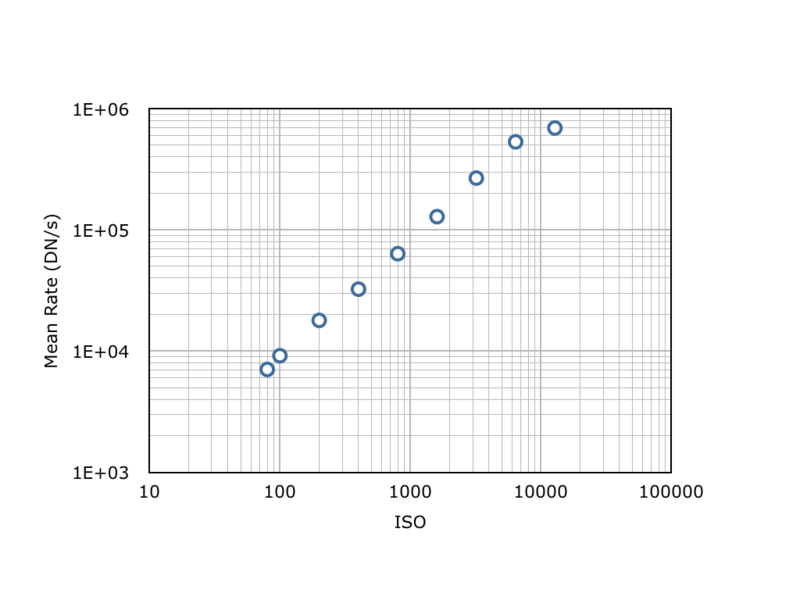 On the other hand, the mean rate does still increase, which suggests that the gain at ISO 12800 is smaller than the gain at ISO 6400, not higher as suggested by findgain. I suspect the camera is applying noise reduction to the ISO 12800 image, which invalidates the standard noise model and leads to discrepancies between the gain determined from the relative mean rate and the gain determined from the noise properties. The dynamic range is the saturation level (the gain multiplied by ADC saturation level of 4096 minus the bias level of 128) divided by the read noise, and the converted into stops (by taking the logarithm to base 2). As expected, the best dynamic range is at the slowest setting of ISO 80. There’s little point in using an ISO faster than 400; the read noise doesn’t fall significantly, but the dynamic range does. Rather than using ISO 1600, for example, it’s probably better to use ISO 400 with 2 stops of exposure compensation. The only use I can think for higher ISOs is getting a brighter live image to frame a shot. The full well at ISO 80 corresponds to a charge density of about 2300 electrons per square micron. This is about the level at which saturation effects begin to blight CMOS and CCD sensors, so the lack of a slower ISO is not surprising.